Honey Walnut Shrimp (核桃蝦) is one of my favorite cooked shrimp dishes of all time. The one thing about Honey Walnut Shrimp, is that I'm picky about my sauce. 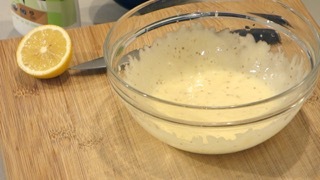 Sometimes when eating out, the sauce can be too mayo-y and since I'm not a huge fan of mayonnaise, it can be overpowering.Good thing is you can make your own homemade mayo, in which case it won't have such a strong mayonnaise taste. 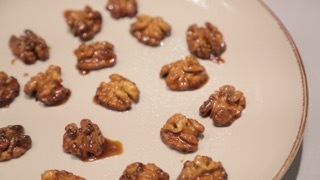 In this recipe tutorial, I'll show you how to make the candied walnuts and the sauce from scratch with our own homemade mayo. With a little elbow grease, it's actually quite easy. If you do check out the video, you'll also see Pike Place Market in downtown Seattle's waterfront. I bought all my fresh ingredients there including the shrimp & honey! 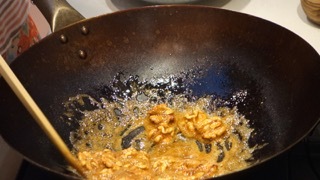 Tip: Prep the candied walnuts and homemade sauce first before cooking the shrimp. 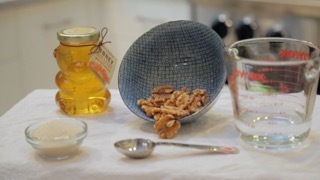 Toast the Walnuts for 2-3 min. 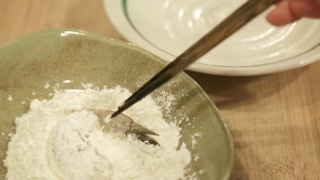 then add in the sweetened water mixture and cook for about 10 min. or until the water has reduced and the sauce has thickened and caramelized. Deep fry the shrimp for about 1-2 min. 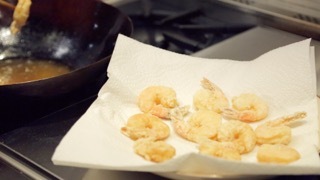 each (doing so in small batches), then allow the shrimp to dry and cool on paper towels for 5 min. before mixing in the sauce.